This antibody was originally tested on whole cell lysate from 293T cells transfected with BNIP3. Levels of constitutively expressed BNIP3 are very variable and a good positive control is strongly recommended. Zhang et al. (2008) comment "Very low levels of BNIP3 protein were detected by immunoblot assay of lysates prepared from WT MEFs that were cultured at 20% O2, whereas hypoxia strongly induced expression of BNIP3 protein, which migrated as a 30-kDa monomer and 60-kDa dimer...BNIP3 expression is regulated by HIF-1 under physiological conditions in vivo." Recombinant fragment (Residues 1-163 of Human BNIP3). The epitope recognized by the antibody resides within amino acids 112-124 of human BNIP3 molecule. This antibody gave a positive signal in human skeletal muscle tissue lysate in western blot and on human kidney formalin-fixed, paraffin-embedded tissue sections in IHC. Our Abpromise guarantee covers the use of ab10433 in the following tested applications. WB Use a concentration of 1 - 5 µg/ml. Detects a band of approximately 30 kDa (predicted molecular weight: 30 kDa). Belongs to the NIP3 family. Mitochondrion. Mitochondrion membrane. Coexpression with the EIB 19-kDa protein results in a shift in NIP3 localization pattern to the nuclear envelope. Colocalizes with ACAA2 in the mitochondria. Lanes 1 - 3: Merged signal (red and green). Green - ab10433 observed at 30 kDa. Red - loading control, ab181602, observed at 37 kDa. ab10433 was shown to recognize BNIP3 in wild-type HAP1 cells as signal was lost at the expected MW in BNIP3 knockout cells. Additional cross-reactive bands were observed in the wild-type and knockout cells. Wild-type and BNIP3 knockout samples were subjected to SDS-PAGE. ab10433 and ab181602 (Rabbit anti-GAPDH loading control) were incubated overnight at 4°C at 5 µg/mL and 1/20000 dilution respectively. Blots were developed with Goat anti-Mouse IgG H&L (IRDye® 800CW) preabsorbed ab216772 and Goat anti-Rabbit IgG H&L (IRDye® 680RD) preabsorbed ab216777 secondary antibodies at 1/20000 dilution for 1 hour at room temperature before imaging. Immunohistochemical analysis of Human laryngeal squamous cell carcinoma tissue, staining BNIP3 with ab10433. Antigen retrieval was performed by heat mediation in citrate buffer. The sections were incubated with primary antibody (1/100) overnight at 4°C in a humidified chamber. Staining was visualized using DAB, followed by hematoxylin nuclear counterstaining. This blot was produced using a 4-12% Bis-tris gel under the MOPS buffer system. The gel was run at 200V for 50 minutes before being transferred onto a Nitrocellulose membrane at 30V for 70 minutes. The membrane was then blocked for an hour using 3% milk before being incubated with ab10433 overnight at 4°C. Antibody binding was detected using an anti-mouse antibody conjugated to HRP, and visualised using ECL development solution ab133406. IHC image of ab10433 staining in human normal kidney formalin fixed paraffin embedded tissue section, performed on a Leica BondTM system using the standard protocol F. The section was pre-treated using heat mediated antigen retrieval with sodium citrate buffer (pH6, epitope retrieval solution 1) for 20 mins. The section was then incubated with ab10433, 5µg/ml, for 15 mins at room temperature and detected using an HRP conjugated compact polymer system. DAB was used as the chromogen. The section was then counterstained with haematoxylin and mounted with DPX. Immunocytochemistry/ Immunofluorescence - Anti-BNIP3 antibody [ANa40] (ab10433)This image is courtesy of an Abreview submitted by Sharon Sneddon. 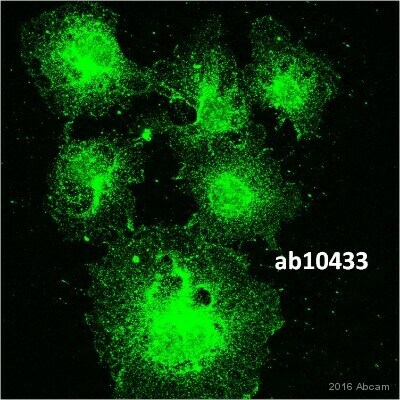 ab10433 staining BNIP3 in Human fibroblasts by Immunocytochemistry/ Immunofluorescence. Cells were fixed in 2% paraformaldehyde for 30 minutes at room temperature and cells were treated with 50 mM NH4Cl in PBS for 10 minutes to quench free aldehyde groups after permeabilisation. Cells were then permeabilized in 0.1% Triton X-100 prior to blocking in 1% BSA for 1 hour at room temperature. The primary antibody was diluted 1/400 and incubated with the sample for 1 hour at room temperature. 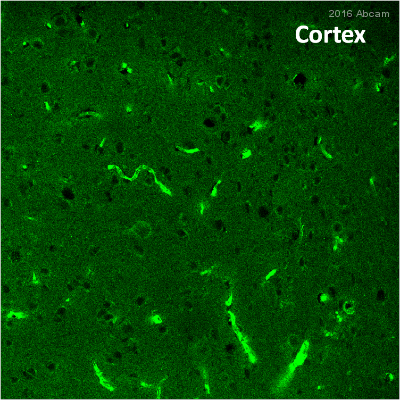 The secondary antibody was Alexa Fluor® 555-conjugated goat anti-mouse polyclonal, diluted 1/1000. Overlay histogram showing HepG2 cells stained with ab10433 (red line). The cells were fixed with 4% paraformaldehyde (10 min) and then permeabilized with 0.1% PBS-Tween for 20 min. The cells were then incubated in 1x PBS / 10% normal goat serum / 0.3M glycine to block non-specific protein-protein interactions followed by the antibody (ab10433, 1µg/1x106 cells) for 30 min at 22ºC. The secondary antibody used was DyLight® 488 goat anti-mouse IgG (H+L) (ab96879) at 1/500 dilution for 30 min at 22ºC. Isotype control antibody (black line) was mouse IgG2b [PLPV219] (ab91366, 2µg/1x106 cells) used under the same conditions. Acquisition of >5,000 events was performed. This antibody gave a positive signal in HepG2 cells fixed with 80% methanol (5 min)/permeabilized with 0.1% PBS-Tween for 20 min used under the same conditions. lease find enclosed the detail concerning ab10433 and the western blots. Many bands are observed on westernblot. It looks like a coomassie staining rather than a westernblot. This antibody (1/1000) was tested on total lysate of HeLa, MEFs (WT and SV40), HCT116, U2OS, Raji, Ramos, Jurkat, Namalwa. I tried monoQc and RipA lysis buffer and the result is the same. Blocking was done in milk 5% and the secondary antibody used is Goat anti-mouse Alexa Fluor680. Wash steps were performed in TBS tween 0.1% for at least 1h. Type of sample (whole cell lysates, fraction, recombinant protein…): Whole lysate from cell lines mentioned above. I would like to reassure you that ab10433 is tested and covered by our 6 month guarantee for use inWB and human samples. In the event that a product is not functioning in the applications cited on the product data sheet, we will be pleased to provide a credit note or free of charge replacement. Reviewing this case, I would like to offer some suggestions to help optimise the results from ab10433. 1.) I suggest to purify mitochondria instead of using crude extract to enrich the protein. It seems to be weakly expressed. 2.) BNIP3 contains PEST sequences suggesting that the protein may be susceptible to rapid degradation by proteases. PEST sequences commonly contain high local concentrations of amino acids P, E, S, T, and D flanked by charged amino acids and these are abundantly present in NIP3. I therefore recommend to block the proteasom with a inhibitor, for example mg132, to avoid BNIP3 degradation. Bellot G et al. Hypoxia-induced autophagy is mediated through hypoxia-inducible factor induction of BNIP3 and BNIP3L via their BH3 domains. Mol Cell Biol 29:2570-81 (2009). 4.) I also suggest to use a positive control. We know of customers that have good results with PC3 cells. 5.) In my opinion the background bands just come up since the protein is not there and the blot is slightly over exposed. Maybe a no primary control will clarify if the secondary is responsible for that. Thankyou for getting back to me. . On this particular order, we ordered Bcl2 and BNIP3; the Bcl2 antibody works fine. 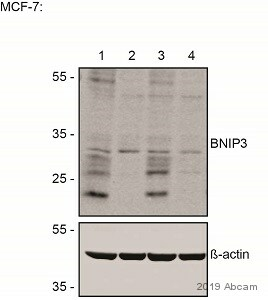 However, the BNIP3 antibody has yet to give us a signal. It is definitley not of the quality of previous BNIP3 antibody that we have received from your company. Please send the replacement to the following address. I am sorry this product did not perform as stated on the datasheet and for the inconvenience this has caused. As requested, I have issued a free of charge replacement with the order number 1126945. This replacement vial will be shipped Monday to arrive Tuesday, July 17. To check the status of the order please contact our Customer Service team and reference this number. I have now run several gels with protein lysates that very recently gave us very strong BNIP3 signal. I have utilized your antibody at 1:500 with little to no signal at the 50-60kd BNIP3 dimer and absolutely no 30 kd signal. I am sure that this antibody is not of the past quality of antibodies I have received from your company and would very much appreciate a replacement and preferablly a different lot. thankyou and I look forward to hearing from you. I agree this vial of ab10433 you have received is not working as expected. I would be happy to send a free replacement. So I can arrange the shipment, please provide the PO number or Abcam order reference number associated with the purchase of this product. According to our records, ab10433 was proving difficult to use in WB and we were in contact in order to help resolve the issue. Looking at our correspondence, it appears that we are awaiting more details to resolve this case. As we discussed over the phone, please let me know if a 1/500 dilution helped to improve the results. If not, I'd be happy to offer either a free of charge replacement, a credit or refund. If the requested information has already been sent, it appears that it did not reach our Scientific Support team and we apologize for this inconvenience. In this case we would like to ask for the information again so that we can reach a resolution. I am sorry to hear that the antibody is not working as before. Ilook forward to hear back from you. Multiple bands developedin blots with the most recent vial. Previous vials gave expected result. I am sorry this product did not perform as stated on the datasheet and for the inconvenience this has caused. As requested, I have issued a free of charge replacement with the order number 1087951. (Please note that the lot that is giving you the multiple bands, GR4979, is a higher concentration of IgG (2.4 mg/ml) than the lot that gave you a cleaner result. However, if you are not seeing a relatively intense band at the expected size, then diluting GR4979 further, for instance 1/2500, will not improve the result). This free of charge replacement vial is also covered by our Abpromise guarantee. Should you still be experiencing difficulties, or if you have any further questions, please do not hesitate to let us know.